Centricity Music band For All Seasons has planned a year full of new releases, starting today with their digital single “Every Good Thing.” In addition to new music, each month the band is releasing podcast episodes, music videos, and live Q&A sessions, all of which tie together with a common theme, for their yearlong “More Than Music” project. With January’s theme Seeing, the California band’s new song speaks of recognizing and acknowledging God’s presence. Featuring resonating pop vibes, “Every Good Thing” was written by band members Emily Hamilton and Jeff Luckey, along with Jeff Sojka (for KING & COUNTRY) and Cameron Jaymes (Matt Wertz). 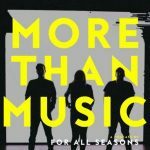 Next week the band will release a music video and new episode of their More Than Music podcast, which give more background about “Every Good Thing” and this month’s theme. The band is eager to connect with listeners through this year’s content. The “Every Good Thing” music video will premiere Thursday, January 31, on New Release Today. For All Seasons will continue releasing new singles the last Friday of each month. For more information, visit their website and follow them on Instagram, Facebook, and Twitter.